The UK government release new economic assessments showing all Brexit outcomes will leave Britain worse off than remaining in the EU. The Chancellor Philip Hammond says that “purely from an economic point of view” it would be better to remain. However, he says May’s deal would only leave Britain “very slightly” worse off. He says the government may have to reconsider leaving the Single Market if May’s deal is defeated in Parliament. LONDON – Brexit will inevitably leave Britain worse off than had it remained in the EU, official forecasts released by the UK government suggest. However, his government today released official assessments showing that he UK economy will be hit under all likely Brexit outcomes. May’s deal would cut UK GDP by up to 3.9% over 15 years, according to official government analysis. A Canada-style free trade deal would leave GDP up to 6.7% lower than if Britain had remained. A Norway-style soft Brexit would not have a negative impact on the economy. The real-terms impact of May’s Brexit deal could be larger than the analysis suggests, as it assumes the UK would roll over all existing EU trade deals with third countries plus successfully strike new free trade deals with at least 17 other countries. 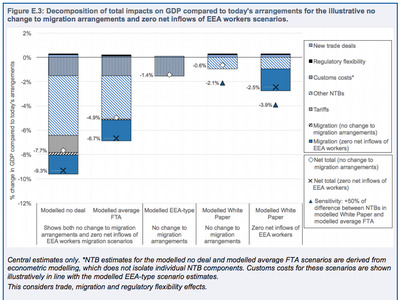 The analysis also shows that any economic benefit from Britain being able to strike these new trade deals would be massively outweighed by the economic impact of increasing trade barriers. Speaking on the Today programme, Hammond said there would inevitably be a cost to any form of Brexit. “Purely from an economic point of view there will be a cost to leaving the European Union,” Hammond said. However, he added that there were potential “political” benefits to Brexit, such as being able to sign independent trade deals and have an independent fishing policy. The analysis, released on Wednesday morning, showed that leaving the EU without a deal would cost the British economy more than £150 billion over 15 years. 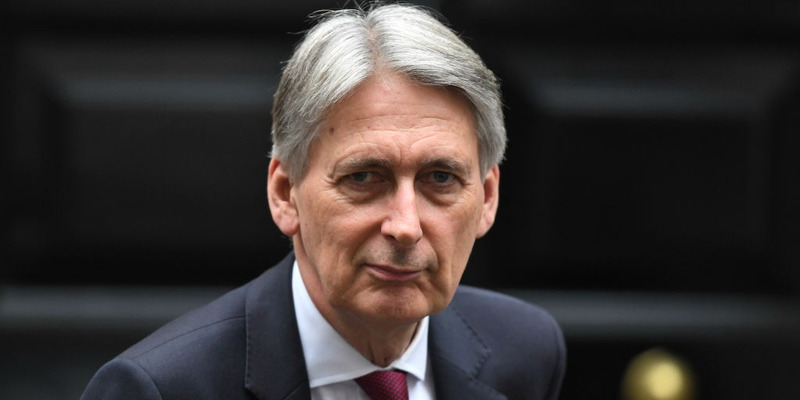 By contrast, Hammond said that May’s deal would only leave the economy “very slightly smaller” than if Britain had remained in the EU. The Chancellor also suggested that the government could be forced to change course and back an alternative form of Brexit, including a Norway-style Brexit in which Britain remains in the single market, if May’s deal is defeated. “If that is rejected then we will have to review the options,” he said. “If you look purely at the economics, then remaining in the Single Market would give us an economic advantage yes,” Hammond said. Business groups said the figures showed the dangers of leaving the EU without a deal. “These forecasts paint a bleak picture over the long-term of a no deal Brexit or a Canada-style deal. It surely puts to bed some of the more far-fetched ideas that a hard landing Brexit will not seriously hurt the economy,” CBI Chief Economist Rain Newton-Smith said. However, hardline Brexiteers in Hammond’s Conservative party accused the Treasury of seeking to undermine Brexit. “The reputation of government economics is in the gutter. That must change. It’s time for the Chancellor to publish all his assumptions and full model documentation so we can begin the process of recovery,” former Brexit minister Steve Baker said. “We’ve all had about enough of Project Fear,” former International Development Secretary Priti Patel said. “We were told during the referendum campaign that we’d each lose £4,300 and that there would be a recession and higher unemployment. And yet we’ve seen record wage growth and record employment levels.